Whitaker also said he has not talked to the president about the probe. Acting Attorney General Matthew Whitaker on Friday defended his handling of special counsel Robert Mueller’s investigation during a highly anticipated grilling by House Democrats, testifying that he had not shared information about the investigation with President Donald Trump. “I have not talked to the president of the United States about the special counsel's investigation … I have not talked about the special counsel's investigation with senior White House officials,” Whitaker said under combative questioning by House Judiciary Chairman Rep. Jerry Nadler, a New York Democrat. (Jonathan Ernst/Reuters) House Judiciary Committee Chairman Jerrold Nadler speaks as Acting U.S. Attorney General Matthew Whitaker testifies before a House Judiciary Committee hearing on oversight of the Justice Department on Capitol Hill in Washington, Feb. 8, 2019. In stark contrast, Whitaker later refused to answer a question from Democratic Rep. Val Butler Demings of Florida about whether he and Trump had discussed the federal criminal case against Michael Cohen, his longtime former personal attorney and fixer. He said he was not going to talk about private conversations with the president. 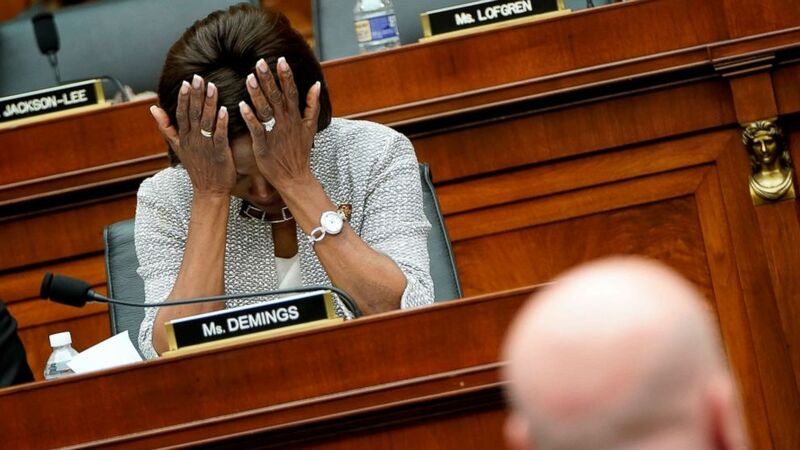 (Joshua Roberts/Reuters) Rep. Val Demings reacts to testimony from Acting U.S. Attorney General Matthew Whitaker as he testifies to the House Judiciary Committee on oversight of the Justice Department on Capitol Hill in Washington, Feb. 8, 2019. Not long after the hearing got underway -- Whitaker defended his decision to not recuse himself from overseeing Mueller's probe. "I have not interfered in any way with the special counsel's investigation," Whitaker testified. Whitaker’s appearance before the committee capped a lengthy standoff with Nadler over the chairman's threat to subpoena the acting attorney general and whether Whitaker might assert that his conversations with the president were covered by executive privilege. 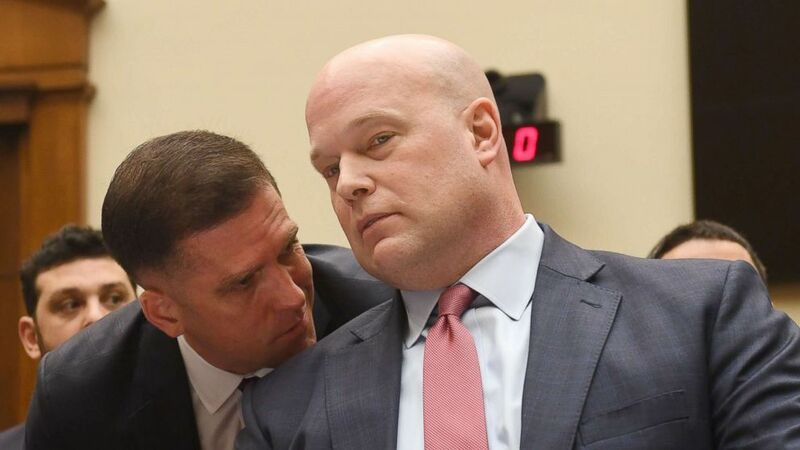 (Saul Loeb/AFP/Getty Images) Acting Attorney General Matt Whitaker consults with a member of his staff before testifying at a House Judiciary Committee hearing on oversight of the Justice Department, at Capitol Hill in Washington, Feb. 8, 2019. 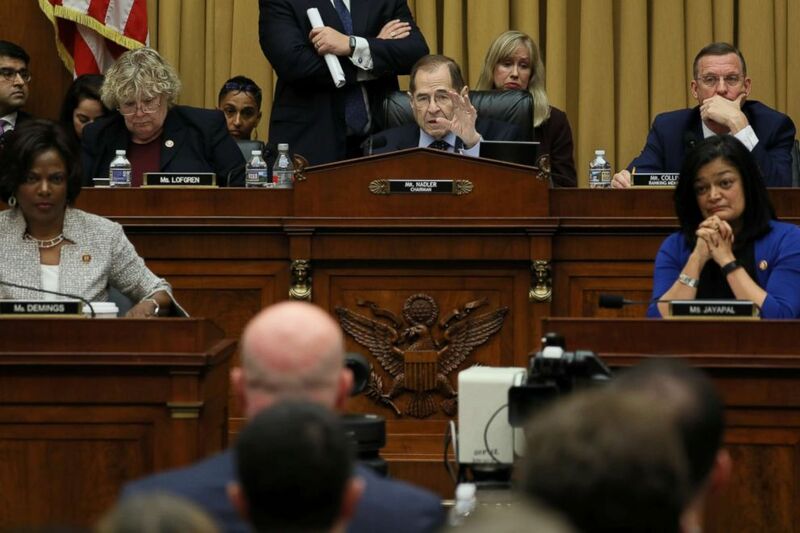 “Why did you ignore the career officials went to extraordinary lengths to tell you that your continued involvement in the special counsel's work would undermine the credibility of the Department of Justice?” Nadler asked in his opening statement. In spite of his previous criticism of the special counsel’s investigation, Whitaker declined, when asked, to say whether he would characterize it as a “witch hunt” – how President Trump frequently refers to it. "Congressman, it would be inappropriate for me to discuss an ongoing investigation," Whitaker told Rep. Steve Cohen, D-Tenn.
Whitaker also fielded questions about the arrest of Roger Stone, the longtime adviser to Trump, who was indicted by special counsel Mueller last month. Congressional Republicans have questioned how heavily-armed armed federal agents took Stone into custody in a pre-dawn raid and have requested FBI director Chris Wray explain the tactics agents used. “Just know the FBI makes an arrest in the manner most likely to ensure the safety of its agents and of the person being arrested,” Whitaker said, before offering to elaborate on the circumstances considered in Stone’s arrest during a closed session. 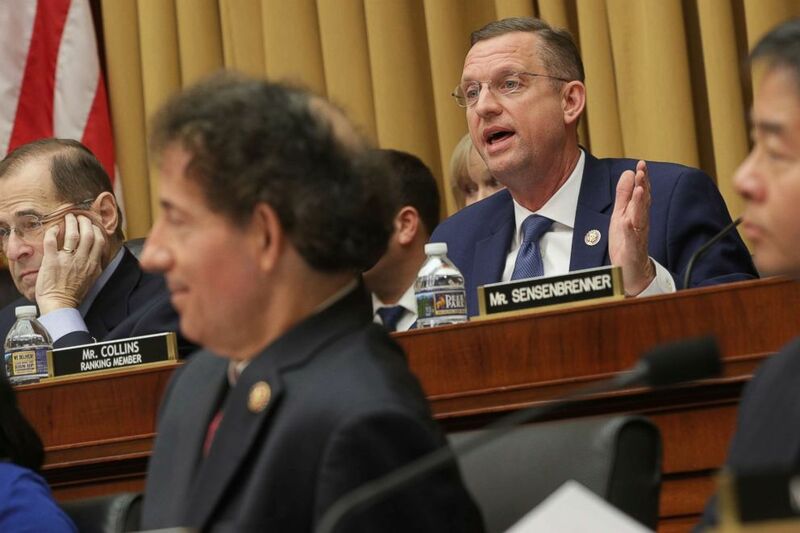 (Alex Wong/Getty Images) House Judiciary Committee ranking member Rep. Doug Collins delivers opening remarks before hearing testimony from acting U.S. Attorney General Matthew Whitaker on Capitol Hill, Feb. 08, 2019, in Washington. Before Whitaker began his testimony, Nadler and the committee's ranking member, Rep. Doug Collins, R-Ga., swapped barbs over the nature of the hearing. In his opening remarks, Nadler condemned Whitaker for refusing to recuse oversight of special counsel Robert Mueller’s investigation. In an impassioned rebuttal, Collins accused Nadler of attempting “character assassination” and called the hearing “a charade.” Collins then moved to adjourn the hearing before it even began, calling for a roll count vote. Only hours earlier, it was unclear whether the hearing would even take place, with Whitaker vowing to bail on the session unless Democrats promised not to subpoena him on the same day he would be sitting before Congress for the first time as head of the Justice Department. Nadler eventually acquiesced, writing Whitaker late Thursday night that he "agreed there is no need to issue a subpoena." In prepared remarks released prior to his hearing, Whitaker wrote that he would “not disclose” details of his conversations with the president. "I want to assure you that I will seek to answer the Committee’s questions today, as best as I can,” Whitaker said in the remarks. “But I also must make clear that I will continue the longstanding Executive Branch policy and practice of not disclosing information that may be subject to executive privilege, such as the contents of deliberations or conversations with the President." Friday's hearing may not be Whitaker's only congressional hurdle. Just hours before Whitaker's testimony, Democrats on another House panel said they had obtained new information that suggests Whitaker failed to pay back money to be distributed to customers of World Patent Marketing, the company he was associated with that had been accused of scamming customers.